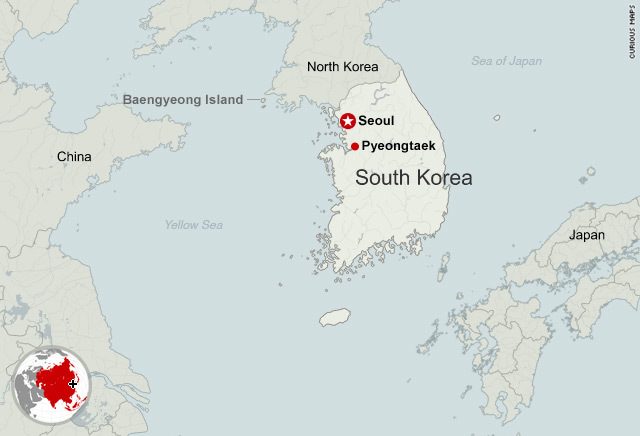 Seoul, South Korea (CNN) -- South Korean officials said Monday they have found what they believe to be the rear section of a sunken navy ship where up to 46 sailors could be trapped, according to the Yonhap News Agency. A 100-foot (30.5-meter) long object had been detected by sonar equipment about 60 yards (54.9 meters) from the site of the sinking, officials told Yonhap. The 1,200-ton patrol ship Cheonan was carrying 104 sailors when an apparent explosion caused it to capsize Friday night in the Yellow Sea near a disputed maritime border between the Koreas. Fifty-eight sailors have been rescued, but hopes were fading for finding the remaining 46. No bodies or survivors have been found in the sea. "We're using an unmanned camera to confirm" the object is part of the ship, a military official said Monday, according to Yonhap. "If the currents remain gentle, we may be able to see some positive results within the morning." No cause has been determined for the ship's sinking, although Yonhap quoted military officials as saying that an unidentified explosion tore a hole in the ship's rear, shutting off the engine. The navy plans to salvage the vessel to determine what caused the incident, Yonhap reported. It was carrying missiles and torpedoes, navy officials told Yonhap. President Lee Myung-bak met with security officials on Sunday and ordered a thorough investigation into the cause of the explosion. Military officials sought to allay fears of the families of the missing sailors, emphasizing that "no deaths have been confirmed yet," according to Yonhap. The Seoul-administered island near the scene of the incident is a flashpoint maritime border area between the Koreas. Given Baengyeong island's proximity to North Korea, North Korean involvement was feared, but South Korean officials have played down that scenario. U.S. State Department spokesman P.J. Crowley said Friday that there was no evidence North Korea was behind the incident. Presidential spokeswoman Kim Eun-hye told reporters there were "no unusual signs" of North Korean activity near the scene. North Korean state media remains silent on the issue.